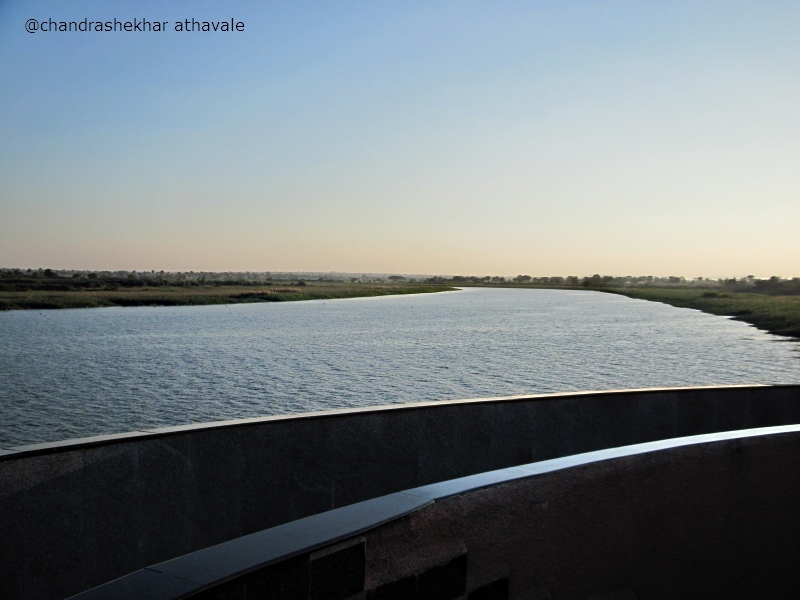 At the point of confluence, river bed of “Krishna” river is much wider, compared to that of “Malaprabha', which makes it look like a small rivulet. The confluence spot is extremely picturesque without any doubt at all. Azure blue water, lavish green banks with all that foliage and clear bright blue sky convert the scene into a magical blue kingdom. Earlier, the river bed of “Krishna” was not so wide and a Shiva Lingam with its temple, existed at the point of confluence. Because of the new dam that has come up on the river, this confluence spot has now gone underwater, as river bed here now is part of the backwaters of the dam. Most of the people from this area belong to “Lingayat” community, who worship this Shiva Lingam and opposed the reality of its submergence. 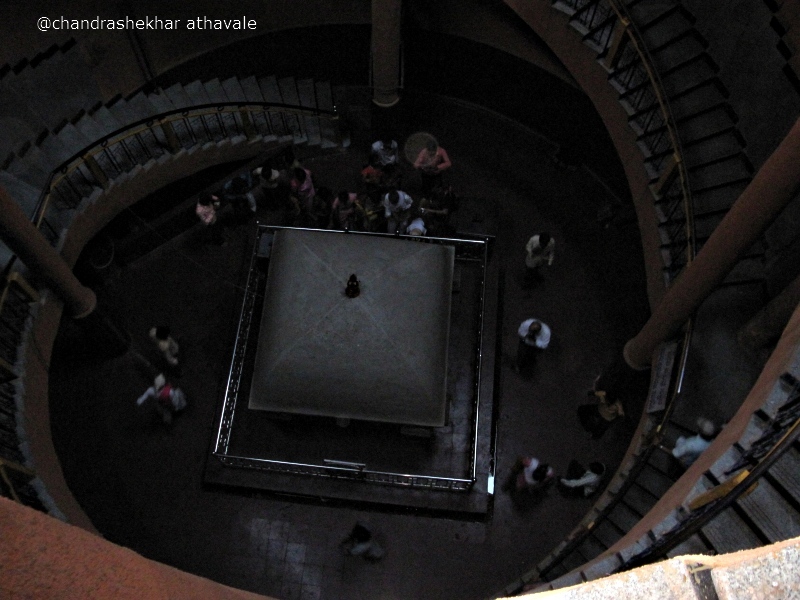 The Government bowed to the pressure and have built a well around this old Shiva Lingam, which now can be seen at the bottom of this well. 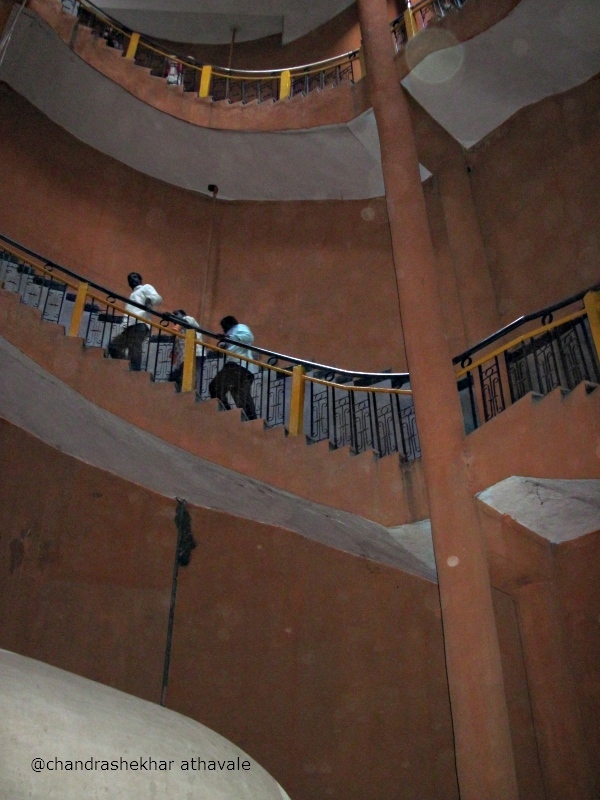 A circular staircase has been built along the inner wall of the well. I cross the river waters by means of a bridge and walk down the well to the bottom. At the top, a balcony has been built around the perimeter of the well. I stand at the point and enjoy the fabulous cool breeze flowing across the waters. It is a lovely experience, which can not be described in words very easily. 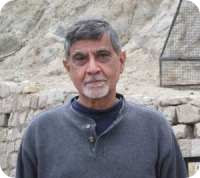 After visiting the confluence, our bus leaves in the northern direction to the last stop of my Deccan safari; Vijapur. On way, we cross a huge dam known by the name “Alamatti.” This dam has become a major dispute between two of Indian states, Karnataka and Maharashtra because of its height. 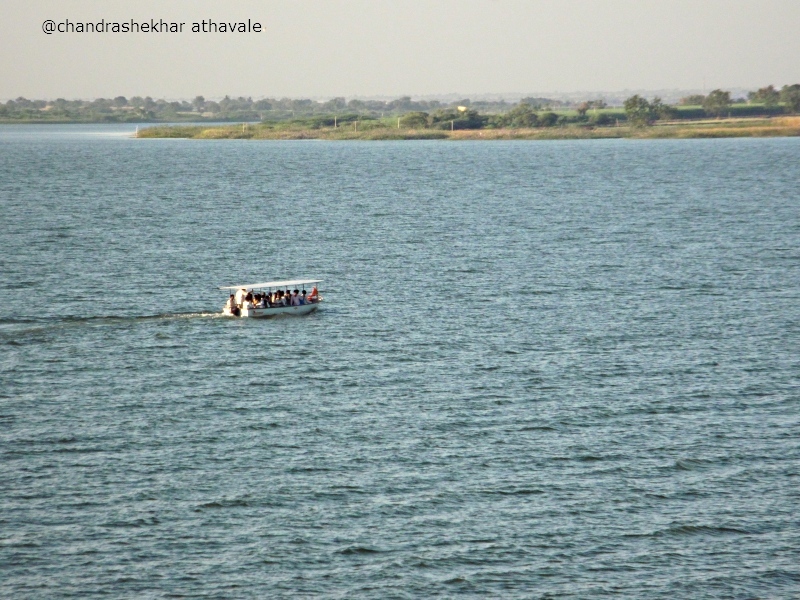 As it is, the backwaters have reached the Sangli city in Maharashtra. 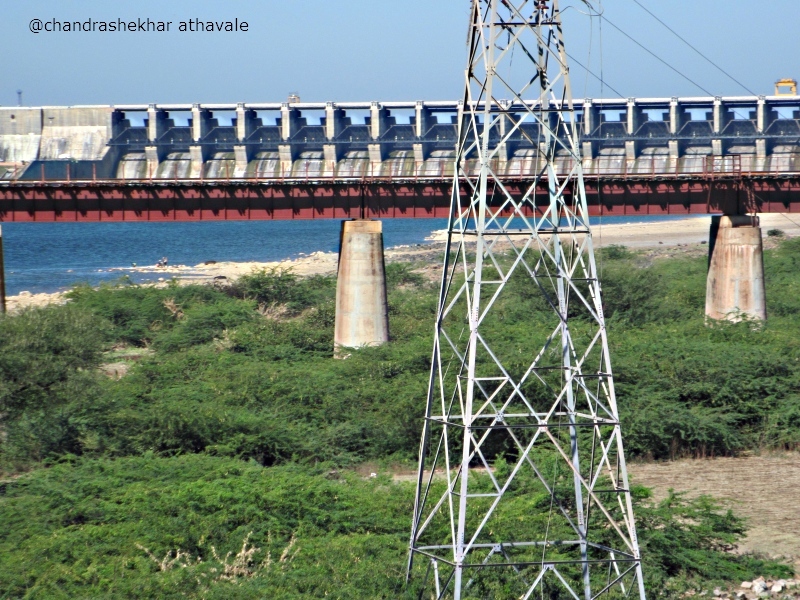 If the dam height is increased further, there are chances that the backwaters may enter the Sangli city itself. This is really the bone of contention as Maharashtra state is afraid that many more villages around Sangli city, would get submerged. Nevertheless, this dam has now transformed once drought prone districts of “Bagalkote” and “Vijapur” into a fertile wonderlands. “Vijapur” district in particular, was always known for its terrible droughts. On way, I stop in “Irakal” town, a place famous for its red hot chillies and sarees. After seeing heaps and heaps of red chilies drying in the sunlight on the road side fields, on my way to the town, I am tempted and buy some chilli powder in the town. This chilli is not considered to be hottest but supposedly gives a great red colour to the dishes. Just next to the “Almatty” dam, which I mentioned above, a vast and beautiful park has been developed by the Government. 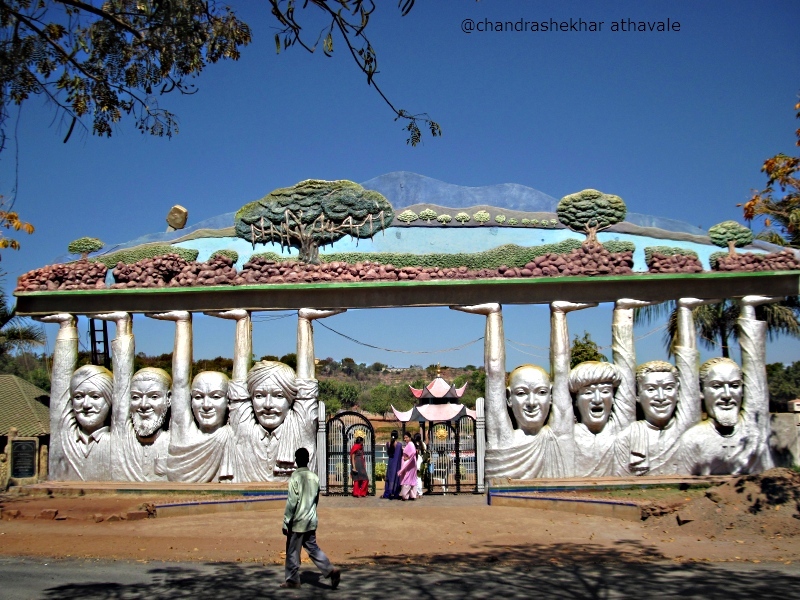 The park, with a beautiful environment and scenes of vilage life with innumerable statues of animals and birds is really worth visiting. I see number of small kids wearing school uniforms, on a day picnic at the park. I can not linger here any longer, as I need to reach “Vijapur” city by evening. In the year 1347, Hasan Gangu Bahamani established his kingdom on the Deccan plains, which is kinown as “Bahamani” empire. It ended in 1480 and was divided in five seperate kingdoms: Imadshahi of Berar, Baridshahi of Bidar, Kutubshahi of Golkonda, Nizamshahi of Ahamadnagar and finally Adilshahi of Vijapur. In addition to these The Hampi empire was in existence in Deccan, as seen by us earlier in this series of articles. In 1565, all these Muslim kingdoms got together and defeated Hampi forces at “Banihatti.” Subsequently, these kingdoms kept on fighting with each other and also with Mughals in control of north India at that time. Slowly one by one, these kingdoms were defeated and disappeared with Nizamshahi last to go in 1636. After this, only two powers remained. Mughals in the north and Adilshahi in the Deccan. 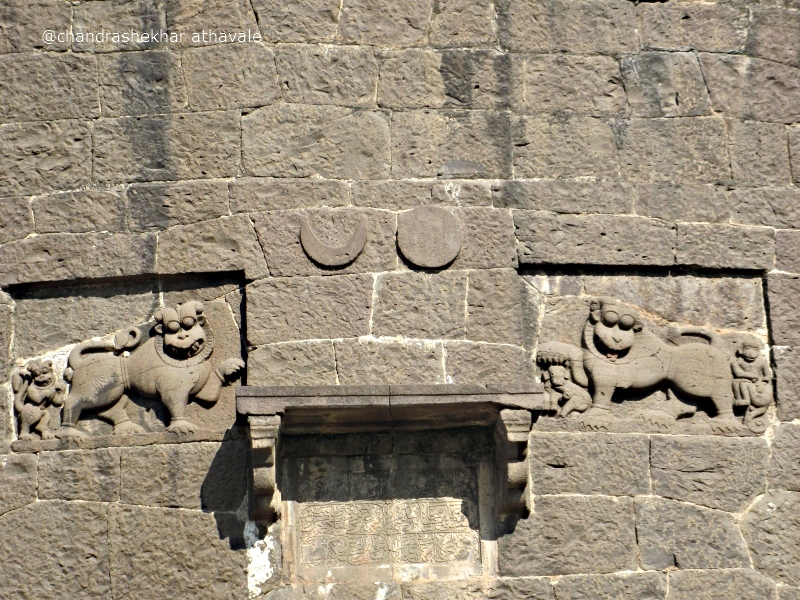 This Adilshahi kingdom ruled over Deccan from 1489 to 1686 almost all over the plateau except for the small area under control of the small kingdom of Great Maratha General, Shivaji. 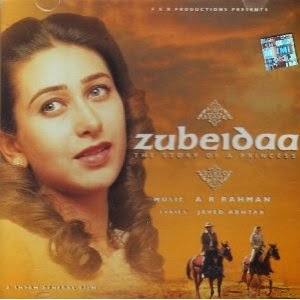 In 1686, Mughal emperor Aurangazeb defeated “Vijapur” armies and Adilshahi saw it's final demise. Since “Vijapur” was the capital of a large empire for more that 150 years, we can still see here in “Vijapur,” many traces of its past glory. All these reasons make it a must for me to include this place in my Deccan safari. 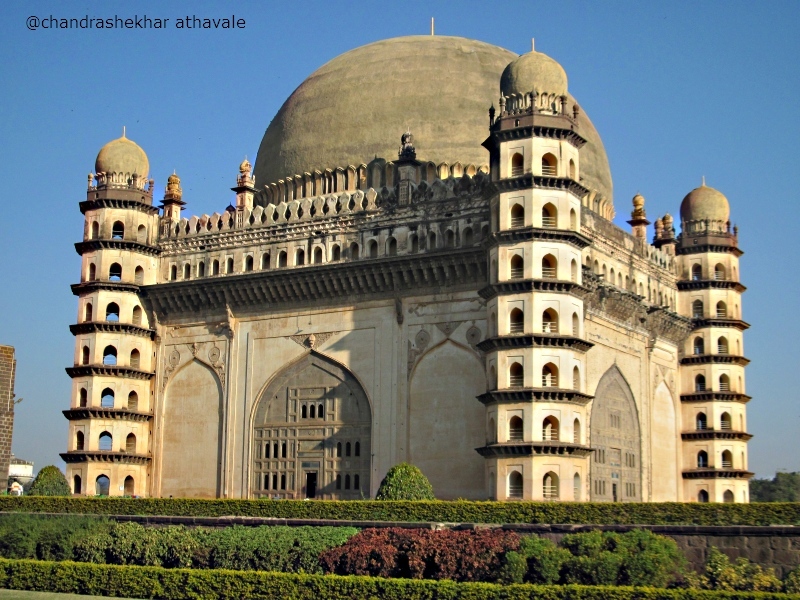 You may enter “Vijapur” from any direction, the first thing you notice is the superb architecture of the magnificent landmark; “Gol Gumbaj.” I am starting my visit from very this building. I have been told, that to enjoy this monument, I must visit it early in the morning. 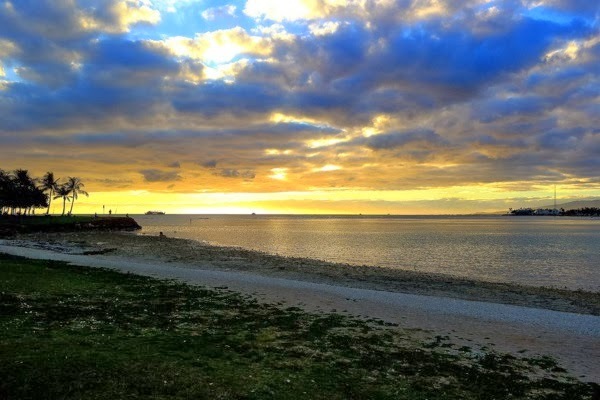 Heeding this advice, I get up early and reach the outer gates of this place at sunrise. 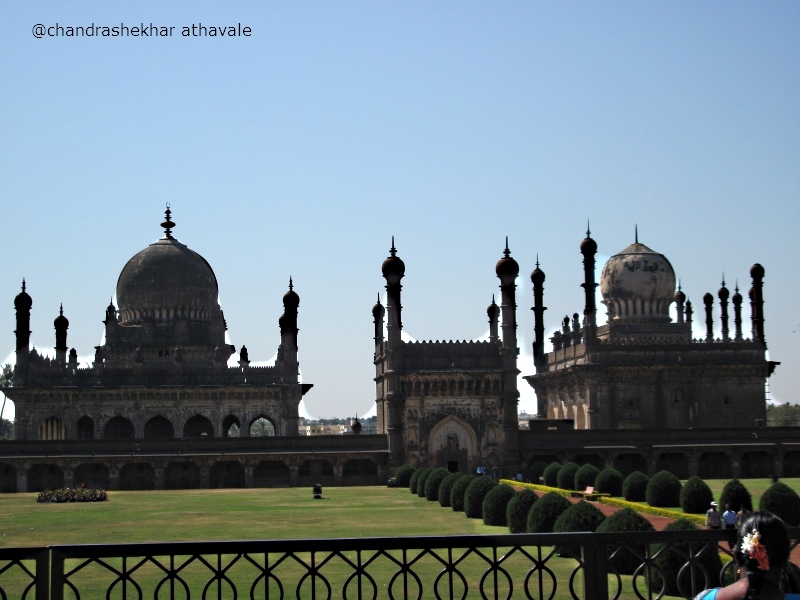 Ahead of me is a facade structure known as “Nakkarkhana,” which houses a museum now. 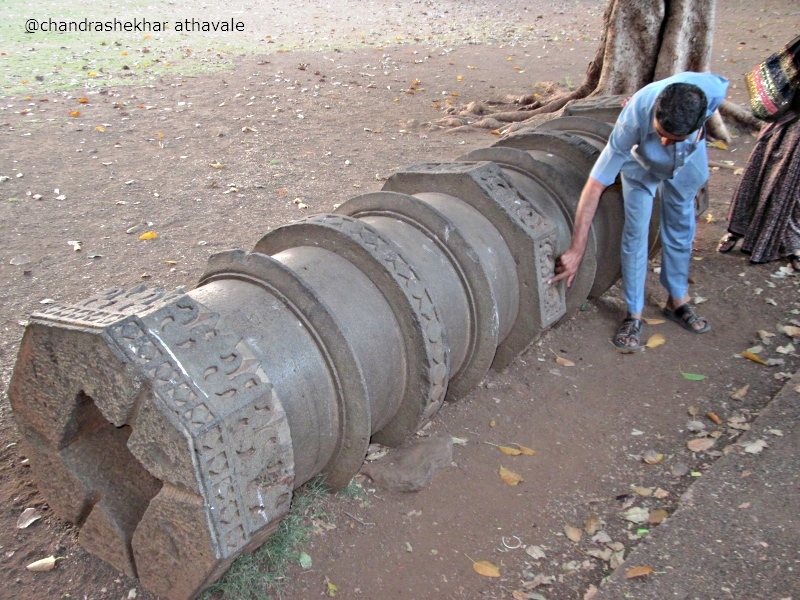 Archeological survey of India has recently found ruins of Jain temples, while excavating at this place, A pillar of a temple from these ruins can be seen lying on the ground. From the place, where I stand now, “Nakkarkhana” structure is completely hiding the main monument of “Gol Gumbaj,” with only top dome and four minars or towers in four corners visible to me. This kind of arrangements were built in those days to make an impression of the grandeur of the main building on the mind of the visitor. 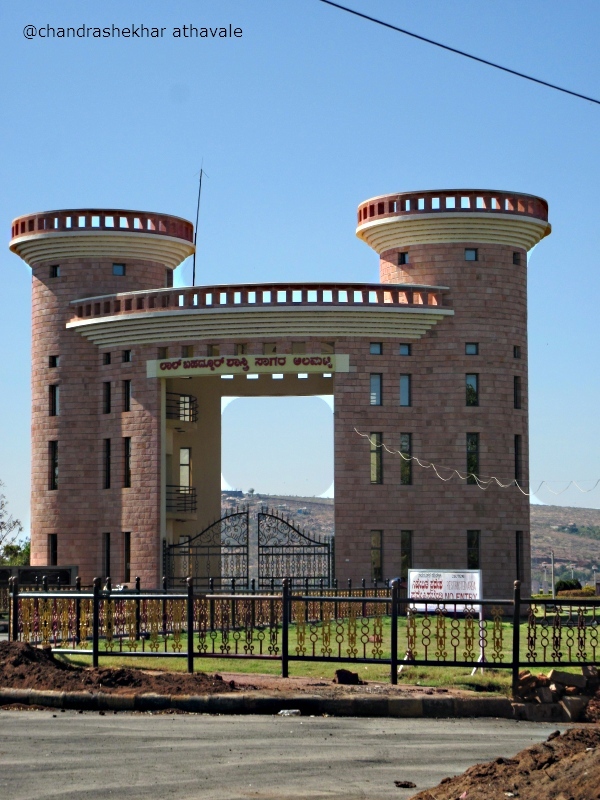 There is one more entry gate between this “Nakkarkhana” and the main structure of the “Gol Gumbaj.” I start walking towards the main structure through the entry gate. This gate has been constructed in such a fashion that as I walk along, I see the top dome of the main structure rise in front of me like a full moon rising in the east. I reach the base of the main building and become acutely aware of the fabulous grandeur of this great structure. I enter from a side door. In front of me, in the middle, are the cemeteries of Mohamad Adil Shah and his wife. However my attention is caught by the sharp beams of sunlight piercing through small windows specially provided in the east, which are directly falling on the cemeteries in the middle and are making them shine as if floodlighted. The Adilshahi kings, after coming to power, would start building their mausoleums first as probably they never knew, how long they would continue to be in power in those days of great uncertainty. They might be thinking that if they do not have a mausoleum ready at the time of the their death, they would never be remembered in the future. I start climbing a staircase built with steep steps in of the corner minar or tower and reach the balcony along the inner perimeter of the top dome after climbing up seven stories. One can witness many amazing effects created by multiple reflections or echoes of a sound produced at a spot in the balcony. 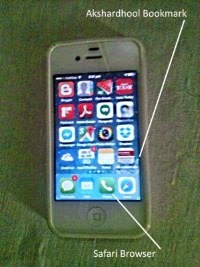 Even if I wrinkle a piece of paper in my hand, it can be easily heard at a distance of 38 meters. This is the reason for this balcony being called whispering gallery. I feel like paying my respects to the architect, who conceived and built this place. 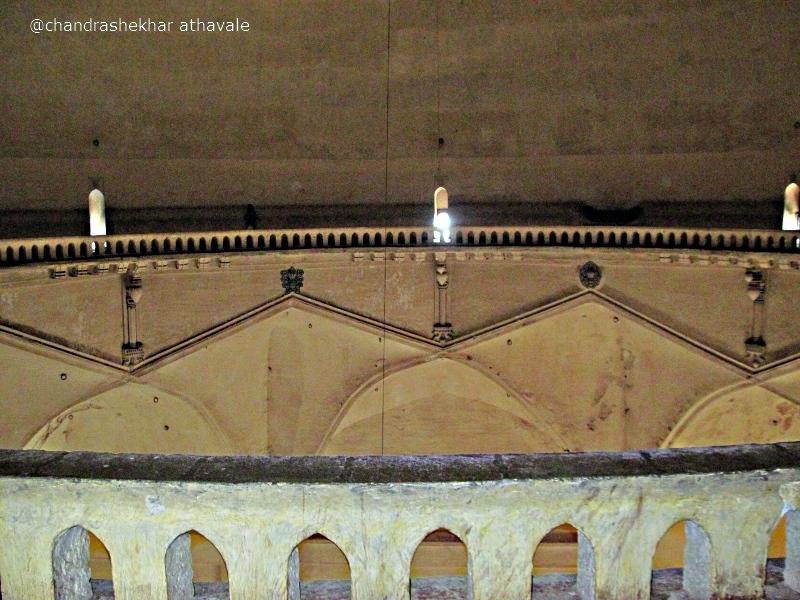 The main hall of this “Gol Gumbaj” is a square of 205 feet with its roof at a height of 100 feet. A 38 meter (120 feet) diameter dome has been constructed above the hall and this entire structure had taken 30 years to build. 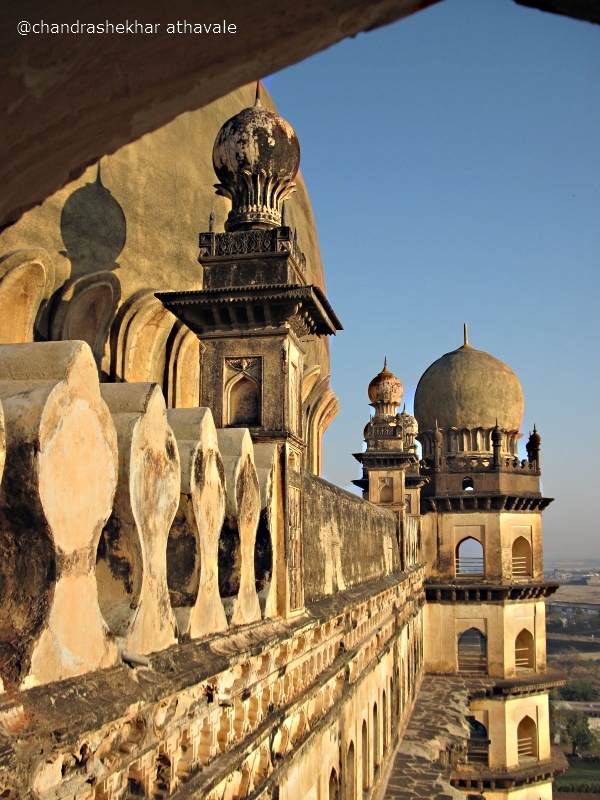 After visiting this amazing “Gol Gumbaj” I move towards the next important place of visit here in Vijapur: the old fort. This fort has retained still, the original ramparts and the rounded towers. I climb one of the towers with the steps built there. 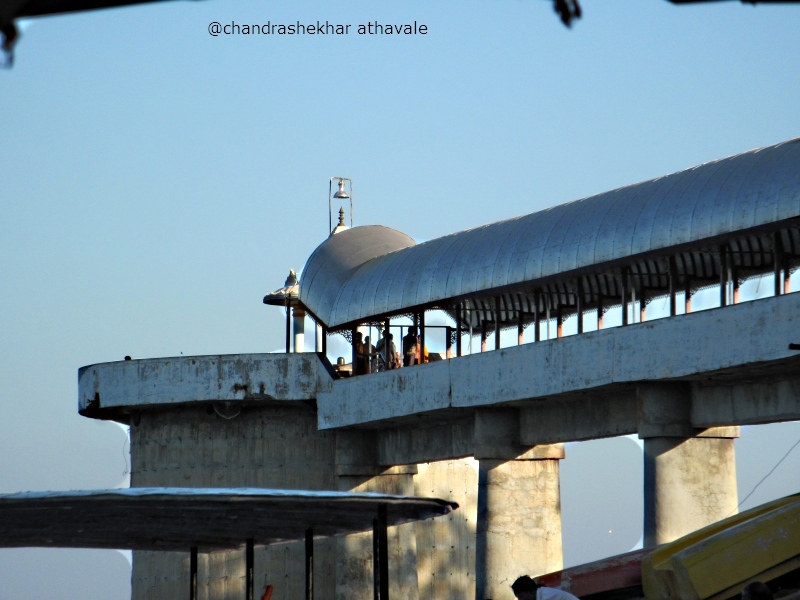 On top I can see the famous “Malika-e- maidan” or 'Queen of a battle' gun, which has been placed there. 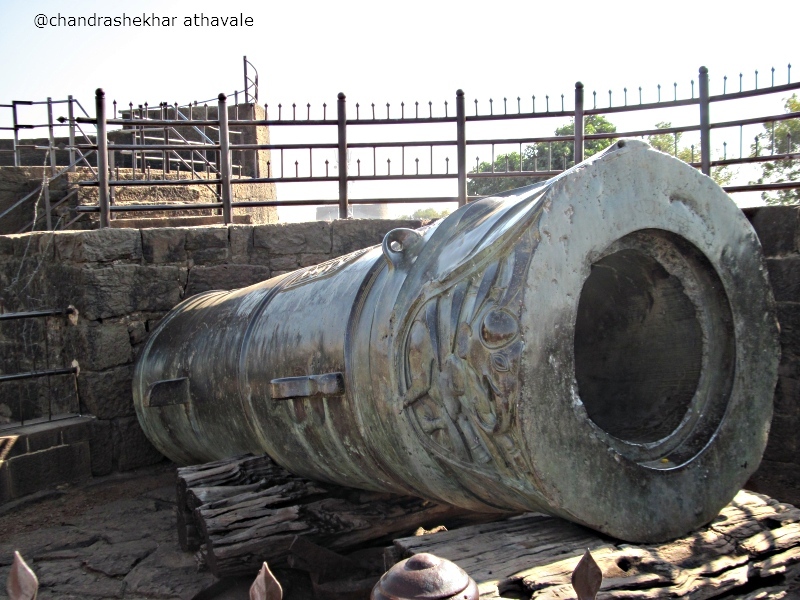 This gun, with a diameter of about 5 feet and length of 14 feet was cast as a single casting in gunmetal in Ahamadnagar, weighing more than 55 tons. 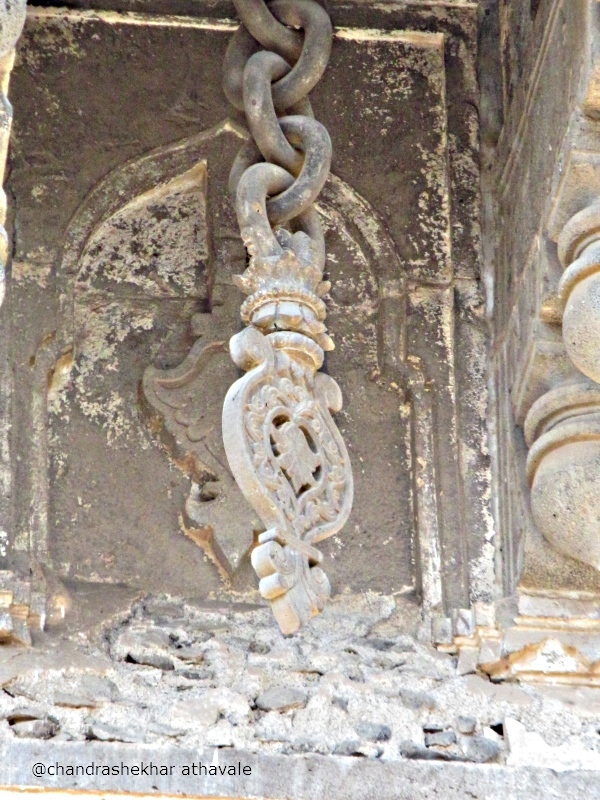 There is an engraved picture of a dragon chewing an elephant under its teeth. When Mughal emperor Aurangazeb had conquered “Vijapur,” he had fixed a plaque on the gun tower, which proudly declares that “ Not only have I won Vijapur, I have also won the Malika-e-Maidan gun.” This gun might appear very scary, however considering its diameter to length ratio, I feel that it might not have been a very effective and deadly weapon. Not very far away from the gun tower is the famous mausoleum of king Ibrahim Adil shah known as “Ibrahim Roja.” This place, surrounded by beautiful green lawns and flowers, actually comprises of two structures, a mausoleum built by the king and a Masjid or a prayer hall. The mausoleum structure has been built in a very dainty and artistic fashion. 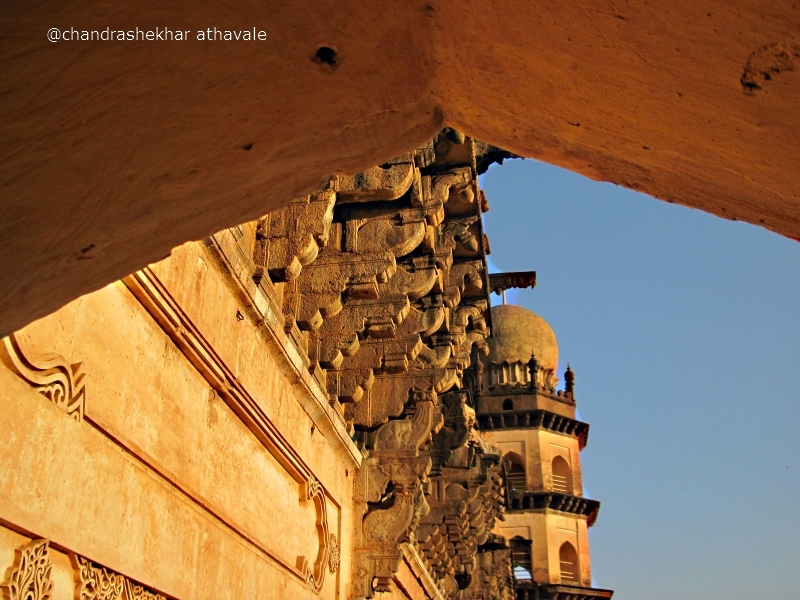 It is said that while building this structure, the king always wanted to build something comparable to the Taj Mahal. 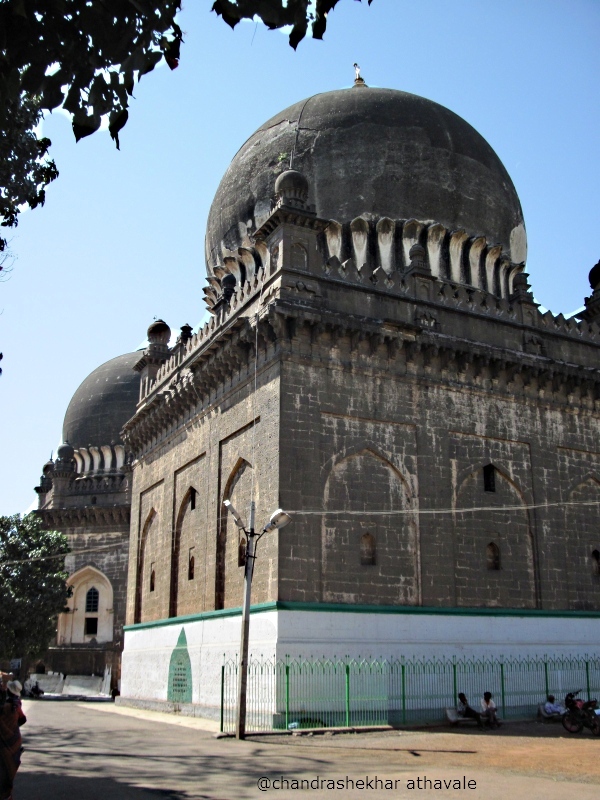 This structure has the burial spots and cemeteries of Ibrahim Adil Shah, his wife Taj Sultana and other family members. 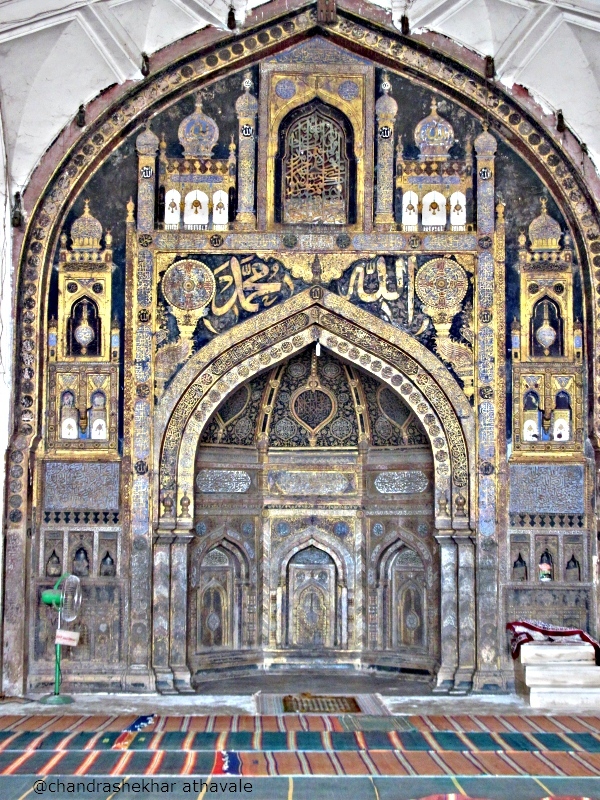 The adjoining structure of Masjid has a huge, elaborately fabricated steel chain hung on the facade wall. It is said that this has been made as per design of an earring of the queen, Taj Sultana. The mausoleum has many decorative panels. Some of which are plans of construction of this building and the basement. No foundation trenches were dug for this building. 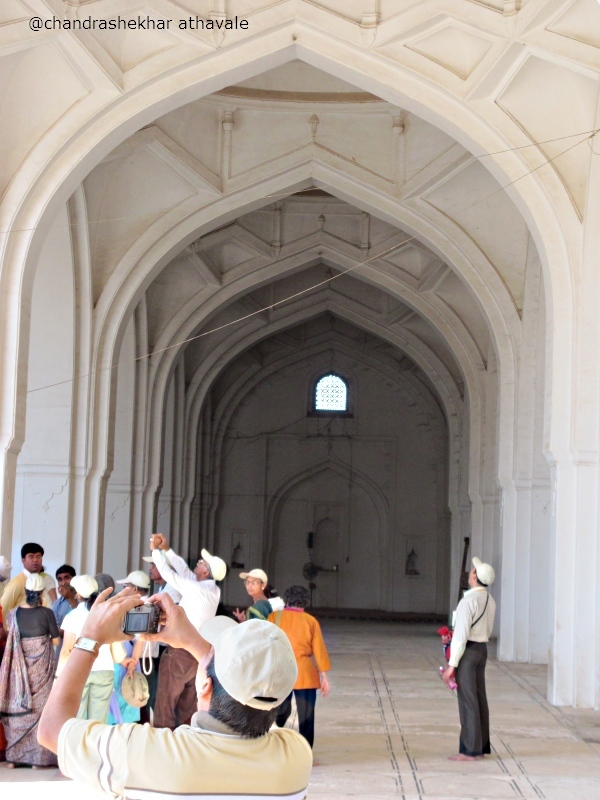 The entire structure stands on pairs of arches placed facing opposite directions of up and down. This fact can be realized after visiting the basement. After dainty “Ibrahim Roja,” I visit the twin towers of “Jod Gumbaj.” During invasion of Mughal emperor Aurangzeb, King Sikandar Adil Shah was ruling. 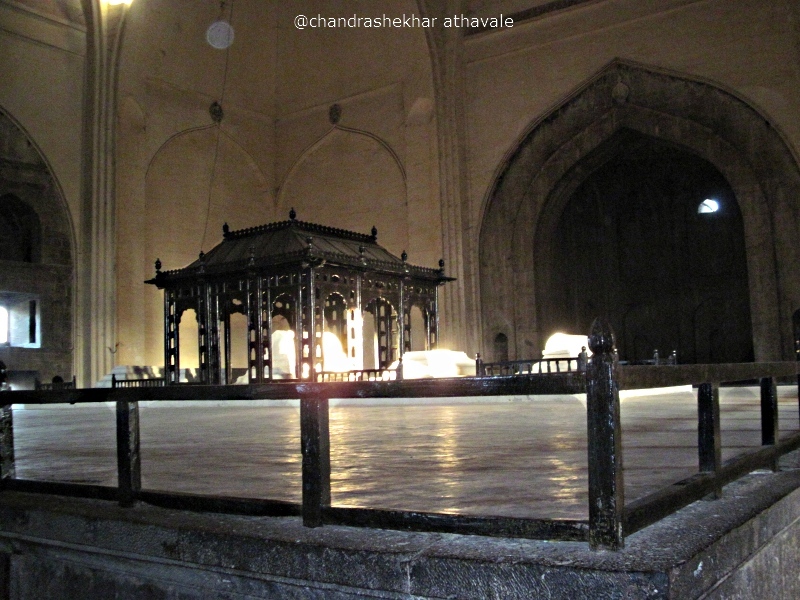 His prime minister or “Vazir” “ Khavas Khan” and his guru “ Abdul Kadri,” have their final resting places here. 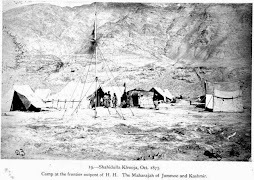 This Vazir Khavas khan, was in reality a traitor to the Adil Shah, helping Emperor Aurangzeb. 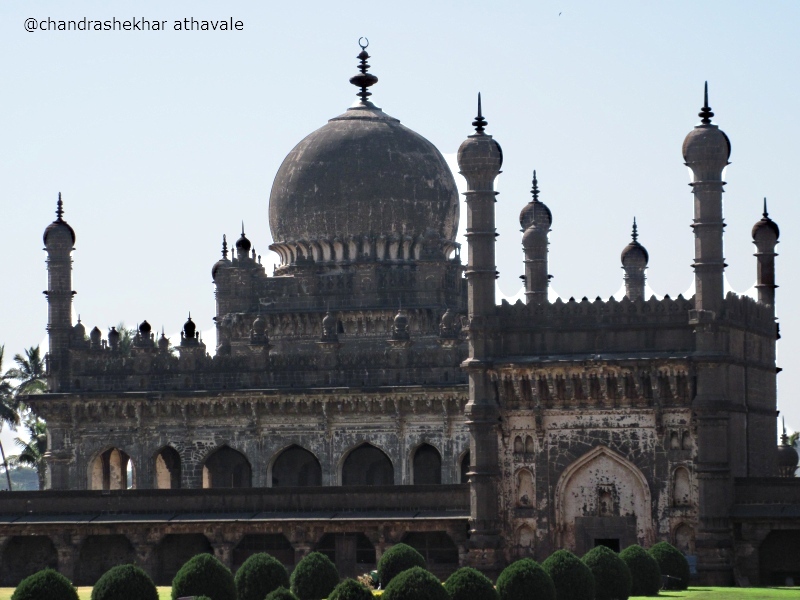 After his death, Aurangzeb had built these structures as his mausoleum. However many tourists visit this place for a different reason altogether. It is believed by many, that by dedicating a piece of a thread, given special powers by a Mulla present in the mausoleum, to the cemetery, one can achieve what ever he wishes. I leave the place, as I am not much inclined to believe in such stuff. 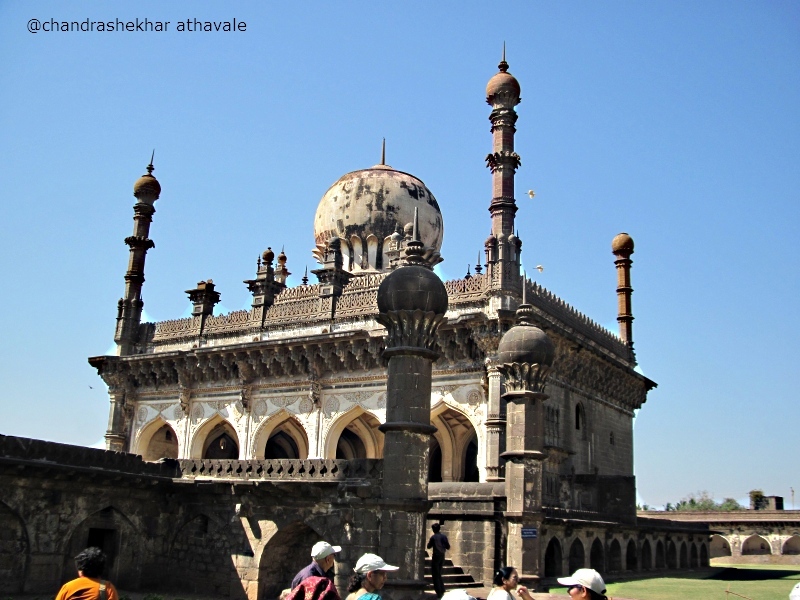 A short distance away is the large sized “Jamiya Masjid” built by first Adil Shah. This structure, built over an area of 1,16000 square feet can be considered as one of the superb specimens of Islamic architecture. About 2250 large sized persons (Like famous Afzal khan killed by Maratha king, Chhatrapati Shivaji) could pay their obeisance to the Allah here at ease. The roof of the structure has been supported on number of arches. The central portion of the west side wall is decorated with quotes from the “Qur’an” and pictures of religiously important places. This spot is called as “Meherab” and a Mulla giving a sermon would stand at this place. The acoustics of this structure has been so designed that even a smallest sound generated at this place, can be heard anywhere else clearly. 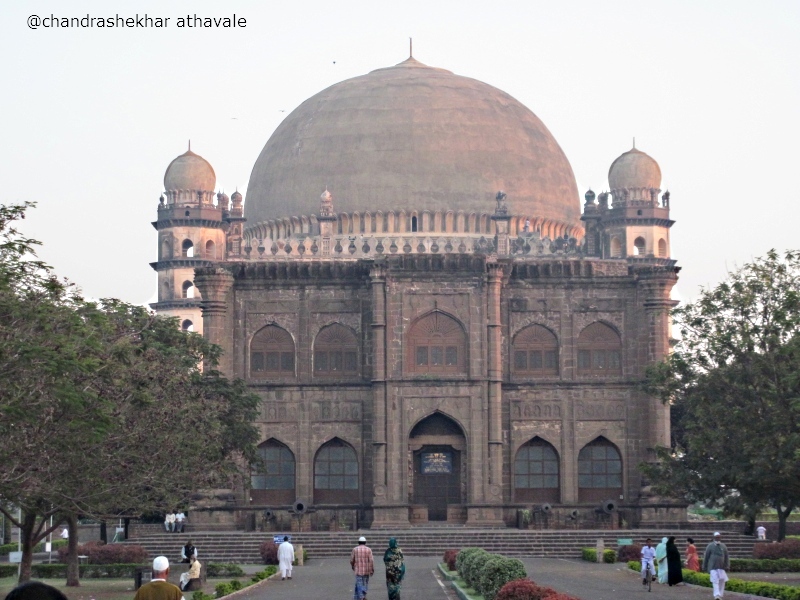 Many Hindu and Muslim person have helped in building and maintenance of this structure including, emperor Auranzeb, Mohamad Adil Shah and Maratha kings from Satara. After visiting all these places of past glory, I am aware that this place must have been a glorious and a affluent city once. 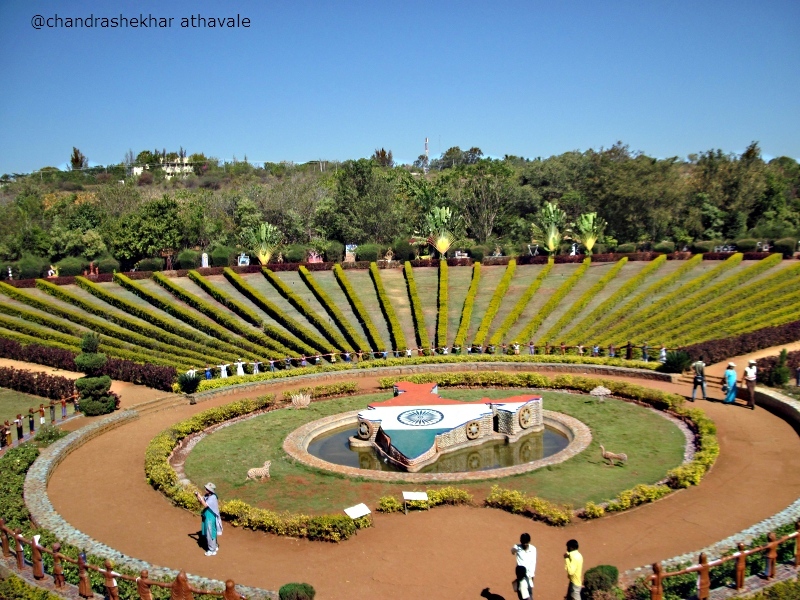 At present, this place, now located in one neglected corner of the Karnataka state, has become a neglected historic city. One realizes this from very poor amenities and bad roads. If better infrastructural facilities like good roads and an airport are created, this place has the potential of being developed like the tourist city of Aurangabad in Maharashtra. 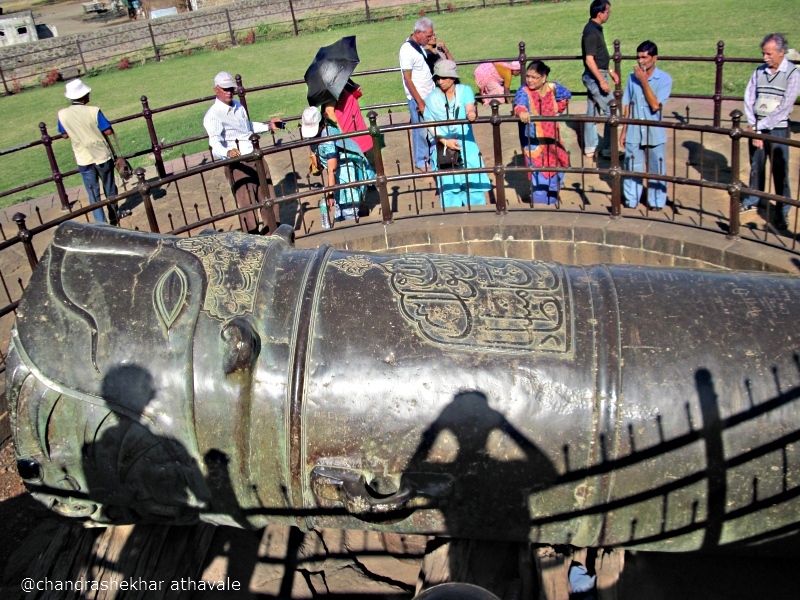 I end my Deccan safari with the visit to Vijapur. 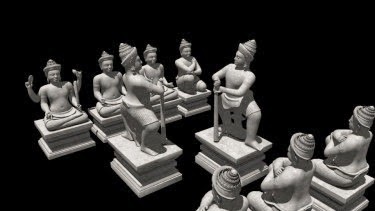 For all these years, I had always connected history of Deccan with just one period of its long and checkered history; the period associated with Maratha kings beginning with Shivaji. 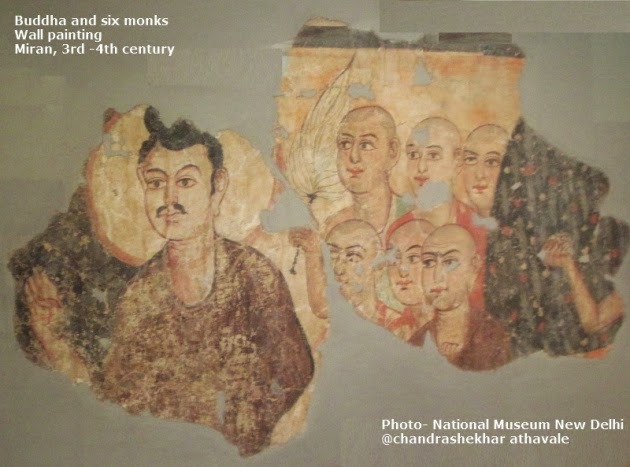 Now along with that period, I have been able to understand in a better fashion, importance of Chalukya kings, Hampi Kingdom and all the Muslim kingdoms including Vijapur's Adil Shahi in the hisory of this land. I clearly understand now, why Kings ruling from Deccan plateau always dreamed of setting up their own independent states, while rest of India was deeply entrenched under foreign rule of Mughals based in Agra and Delhi. I feel that history of Deccan teaches us the importance of independence and this history, much neglected in the history books should be given its due place.